Lens Flare is an optical aberration due to light scattering within the Lens. Despite being unexpected, is not necessarily to be avoided in all cases. In some photos it is in fact specially added. In this article we want to talk about when to use Lens Flare and when not. Camera lenses do not only have a front and a rear lens. Inside are several groups of lenses, as you can read in the specifications of each lens. Sometimes it happens that some rays of light entering the lens and instead direct hitting it hits the bottom and then the sensor will reflect these rays on the internal lenses several times, forming the lens flare. This phenomenon is more likely to happen, when in the frame very strong light sources is present or the light penetrates laterally with respect to the sensor. The result is that, the photo typically loses contrast and form of the spots of different shapes or bright stripes. In most cases, you will want to avoid the lens flare. Here are several ways to do it. First of all, keep the front lens clean. Simply a blower to dust and a microfibre cloth will work fine. Then, try to keep the lens hood mounted, it is done for purpose. In the absence of the hood, you can use your hand to shield the light source that is creating the lens flare. If you can, use a fixed focal length lens. Internally it is simpler, contains less lens groups, thereby reduces the probability of internal reflections. Use lenses with lens coating (coated, in other words). These are properly treated, just to avoid reflections that generate the flare. In general, lenses with higher quality (and therefore more expensive) greatly reduce the risk of having lens flare. Even telephoto lenses can help, at the lower corner of the field, in fact, the chance of including the light sources in the frame get reduced. As always, the angle of field limits the possibility that the light enters in an incident from the front lens. Try to move you as much as possible with the shoulders towards the light source, keep something between you and the source of light. Some object, such as the branches of a tree, or a person, if you can not do otherwise, slightly changes the frame so as to move the flare in a position that gives less hassle. Finally, the post-production can help. When the flare is isolated in the form of a single or a few spots or stripes, both Lightroom and Photoshop provide tools that allow you to remove it with a couple of clicks. Overturning the advices above, you can increase your chances of getting the flare. Remember though, that you can never completely control it. For example, you can make sure that the lens flare appear, but will not be able to determine the exact shape. To have a little more control, you want to use the live view. It could also happen that you see the flare in the viewfinder, but this shows when you are at the maximum aperture. 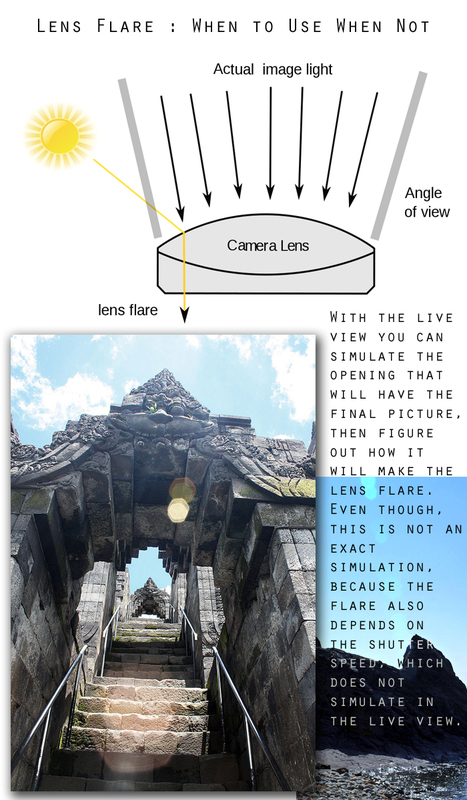 With the live view you can simulate the opening that will have the final picture, then figure out how it will make the lens flare. Even though, this is not an exact simulation, because the flare also depends on the shutter speed, which does not simulate in the live view. The first thing to do is to shoot against the sun, or include a very strong light source in the frame. In the second case it may be a street lamp lit, for example. Often when the light source is very strong, you do not need it to be present in the frame. This is especially true when the light source is the sun, since it is the strongest source that you have available. Dirty lens helps lens flare. This does not mean pulling a bucket of mud on the lens! Just the dirt that accumulates as a result of normal use will work. Consistent with your compositional choices, a wide angle lens is better than a telephoto lens, when we speak of lens flare. The wide angle of field makes it much easier to include a light source in the frame, in addition to the subject. Moreover, it also facilitates the entry of light rays. Speaking again of objectives, using older lenses, without coating – the lens flare becomes more likely to appear. Finally, to facilitate the entry of light directions badly at acute angles facilitate the flare, in case you do not use the lens hood. Also using filters may increase the likelihood of flare, but not so simple. Simply, the addition of a further lens increases the probability that the unwanted reflections will be created. If you did not get the flare and want at all costs to have it, you can always add it in post-production. On the internet you can find many tutorials that talk about it. The lens flare was fashionable a few years ago. Perhaps recently is coming back, even in the cinema. But it is easy to misuse. Like many other effects very obvious, it should be used sparingly and only when inserting is indicated and justified. Also, try as much as possible to avoid having to add with photo editing, it is very easy to ruin a photo in this way. Als Frau kann man aus einem riesigen Sortiment an Schmuck w?hlen. Ringe und vieles mehr sind f?r das sch?ne Geschlecht entworfen wurden und schm?cken die Damenwelt ausgezeichnet. Als Typ stehen einem jedoch sehr viel weniger M?glichkeiten zur Verf?gung. Cite this article as: Abhishek Ghosh, "Lens Flare : When to Use When Not," in The Customize Windows, September 4, 2013, April 26, 2019, https://thecustomizewindows.com/2013/09/lens-flare-when-to-use-when-not/.